The UK Space Agency is awarding £325,000 to the UK Association for Science and Discovery Centres (ASDC) to bring the latest space science to children and families across the UK. This will help create new resources based on real scientific and engineering challenges, including those facing the operation of UK spaceports, rockets and spaceplanes. Together, up to 14 UK science centres and museums will deliver activities to 200,000 children and adults until March 2021, building on the success of ASDC’s Destination Space education programme, which reached more than 900,000 people during Tim Peake’s Principia mission. As the Launch UK programme continues to build momentum, a further £600,000 is on offer for businesses capable of providing range control services. These cover a wide variety of tasks from tracking rockets and spaceplanes in flight, to notifying users of airspace when launches are taking place. View the Commercial Range Services call for proposals. The UK space sector is growing rapidly and there is a global movement towards the commercialisation of space activities. Through the government’s modern Industrial Strategy, the UK Space Agency is at the heart of capitalising on these exciting developments for the UK, helping to generate new jobs, economic growth and opportunities in science, technology and industry. "Our spaceflight programme includes a series of education and outreach activities, focusing on space launch from the UK, which I hope will play a major role in inspiring the next generation of space scientists, engineers and entrepreneurs. "We have also published a new call for proposals to deliver range control services, which are vital for ensuring the safety of UK spaceflight operations once they look to begin in a few years’ time." The UK Space Agency has also funded 21 new Pathfinder projects from its National Space Technology Programme, offering funding and support to those looking to develop technology and build new capabilities for the UK space sector. View the new NSTP Pathfinder projects. In March this year, the Space Industry Act 2018 came into law. 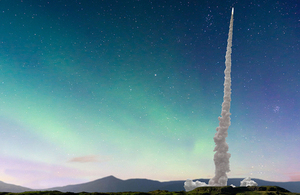 This was followed in July by the award of £31.5 million of grants from the Industrial Strategy to support the development of a proposed spaceport in Sutherland, Scotland, and the commercial operations of Lockheed Martin and Orbex from the site. In November, European businesses Eutelsat Communications and Airbus Defence and Space signed a deal worth hundreds of millions of euros which will see satellite components and major parts assembled in Portsmouth and Stevenage, before final assembly is completed in Toulouse, France. This has been followed by another commercial announcement today between UK company Inmarsat, a world leader in global mobile satellite communications, and Mitsubishi Heavy Industries, Ltd. (MHI), in which Inmarsat becomes the first commercial customer to place an order for MHI’s new launch vehicle, H3. "Science and innovation have no borders, as long-term strategic partnerships like this one built on excellence between Inmarsat in the UK and Mitsubishi in Japan demonstrate. The space sector is a UK success story and an industry that is growing globally, a year since the launch of our modern industrial strategy, we continue to build on our commitment to space, including through the announcement of the UK’s first spaceports and record investment in our world leading science base."